When it comes to buying a crossover or sport utility vehicle, buyers in Canada and Nova Scotia have plenty of options available to them. Indeed, there are literally hundreds of crossovers and SUVs on the market and they can meet the needs of any buyer, as diversified as those needs then to be. That said, if you are looking for refinement, technology, comfort, and luxury in an affordable package, the all-new 2017 Buick Envision is the perfect option for you. When it comes to luxury features and comfort, the new 2017 Buick Envision certainly has a lot to offer its owners. Starting at $39,995, the new 2017 Envision comes standard with a rearview camera, cruise control, dual-zone climate controls, Sirius XM satellite radio, 4G LTE with Wi-Fi Hotspot, heated leatherette seats and more. There are plenty of versions in the Buick Envision family including the Premium I and Premium II models, as well as the middle-of-the-line Essence model. Features offered in all or some of these models include ventilated and cooled seats, sunroof, a navigation system, park assist, tri-zone climate controls, 120 V outlet, rear heated seats, and a lot more. There are also a ton of active safety features which keep you and your family safe. These include blind spot monitoring, active lane keep assist, adaptive cruise control, forward collision alert and front automatic braking, along with lane departure warning and rear cross traffic alert. Let’s not forget Buick’s unique and patented Teen Driver mode which allows parents to keep an eye on their teens when they are behind the wheel. This means that you can see how the 2017 Envision was driven, and also prevent your teen from turning off certain safety features. There are two engines offered in the new 2017 Buick Envision. The first is a 2.5 L four-cylinder unit that delivers 197 horsepower and 192 lb-ft of torque. It has an average fuel economy rating of 8.4 liters per 100 kilometers on the highway. That said, buyers who want more power will opt for the 2.0 L four-cylinder turbocharged engine that delivers 252 horsepower and 260 lb-ft of torque. Both engines are paired with a six-speed automatic transmission, and all-wheel drive is standard on the new 2017 Buick Envision. As for interior space, buyers get 761 liters of cargo space, and plenty of leg and head room. The 2017 Envision also shines by offering comfortable seats and a quiet cabin which really helps make long drives relaxing and enjoyable. 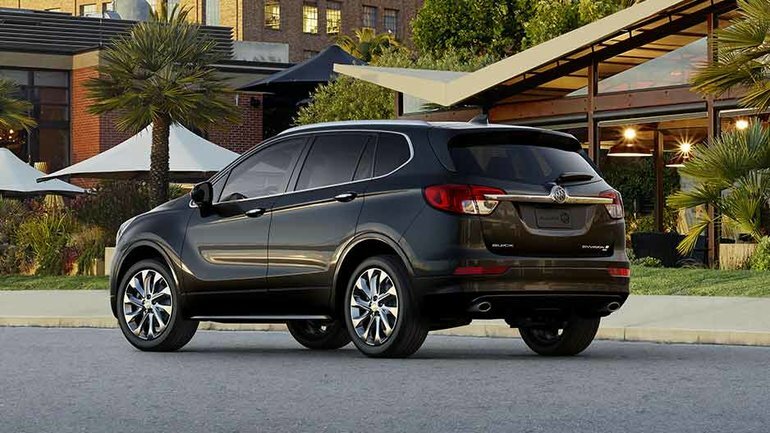 To learn more about the 2017 Buick Envision, contact us today at Bruce GM Middleton.